The New York Times bestseller that won the PEN America award for the best biography of the year, and the New-York Historical Society book prize for the best volume of American history published in 2017. A finalist for the Pulitzer Prize. "John A. Farrell narrates this story with punch and insight...the best one-volume, cradle-to-grave biography that we could expect about such a famously elusive subject. By employing recently released government documents and oral histories, he adds layers of understanding to a complex man and his dastardly decisions." "Confirmation of Nixon's meddling in Johnson’s peace efforts is the … news that “Richard Nixon” breaks. But startling revelations are hardly the only criterion for a good Nixon biography. He’s an electrifying subject, a muttering Lear, of perennial interest to anyone with even an average curiosity about politics or psychology. 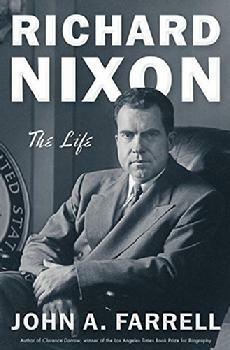 The real test of a good Nixon biography ... is far simpler: Is it elegantly written? And, even more important, can it tolerate paradoxes and complexity, the spikier stuff that distinguishes real-life sinners from comic-book villains? The answer, in the case of “Richard Nixon,” is yes, on both counts." "A tale that presents Nixon from boyhood to senator, power broker and president, in all of his complexity and contradiction." Exceptionally relevant in the age of Trump. Like the book on Facebook to get updates and news of the author's book tour. Richard Nixon: A Life has received starred reviews, reserved for books of exceptional quality, from Publishers Weekly, Kirkus and Booklist. "John A. Farrell has once again delivered a rich, precisely written portrait of the past to help us understand the present. He traces the origins and turning points of one of the most complex, complicated and fascinating presidents of the modern age with flair and narrative skill. Each page is a joy to read," writes John Dickerson, moderator of CBS's Face the Nation and author of Whistlestop: My Favorite Stories from Presidential Campaign History. "Richard Nixon's political career has all the nooks and crannies of an English muffin: the red-baiting of the early campaigns; Checkers; the Great Debates of 1960; the comeback in '68; the inheritance and horror of Vietnam; the historic opening to China; the shame of Watergate," says Chris Matthews, the host of Hardball, and author of Kennedy & Nixon: The Rivalry that Shaped Post-war America. "In Richard Nixon, John A. Farrell is tough and unyielding, yet gives his subject a fair hearing through each gripping episode. `I'm not a quitter,' Nixon once protested, and this grand, indispensable book proves him right, right to the end." Read in The New York Times on how Nixon secretly worked to scuttle Lyndon Johnson's Vietnam peace initiative in 1968 - and how fellow historians hailed the discovery.